Becoming a customer-focused company is no longer an option. The conversation surrounding customer experience has changed significantly over the last 5 years. No longer are organizations debating the importance of customer experience in their ongoing success. Most have embraced the reality that consistent positive customer experience is now basic table stakes in today’s marketplace. The direct correlation between the degree and consistency of customer experience and an organization’s performance is irrefutable. These are tough questions. And because most people don’t fully appreciate how daunting a culture-change undertaking really is, few actually spend enough time or thought answering them. Nor do most organizations really fully commit to reinventing themselves. The inevitable, and most common, result is that change doesn’t happen or doesn’t stick; investments in time and money show no return; promises are broken and objectives remain unmet. Clearly define what World-Class customer experience is for your organization. What does it look like and feel like? What is the vision? Create a customer journey map. Identify all of your core customer touchpoints, and exactly what has to happen in each. Make sure that everybody in your organization, from the highest executive to the most part-time employee, understands the company’s objectives, their roles and the expectations you have of them. This involves consistent messaging throughout the organization. Make sure your company has all the tools – both physical and intellectual – it needs to execute the plan. Training is critical. Once you’ve established your goals and performance metrics, be relentless in assisting and encouraging people to achieve them. Your standards and expectations must be non-negotiable. What gets measured gets done. Measure both end results (i.e. using sales figures or Voice-of-the-Customer data), and the behaviours that drive the results (i.e. Mystery Shopping, Internal assessments, etc.) You need to be tracking your performance on an ongoing basis. If you don’t, how will you know if anything is changing? Make sure you celebrate all successes along the way and don’t lose momentum. Continual acknowledgement and appreciation of efforts are critical. Make sure all of your leaders – managers, supervisors – understand that this is their primary mandate. Train them to do it well. Align your processes, compensation structures, etc. to recognize people as they progress through their journey of change. Take an ongoing, obsessive-compulsive look at your policies, processes, people and practices to make sure they remain focused on the same goal. Don’t be afraid to change things if it’s for the right reasons. It might be changing a process, improving an IVR system, simplifying your cash management or return processes. It might be as big as restructuring an entire department, or as small as changing the way people answer the phones. And don’t be afraid to discard one of your initiatives if it’s not working. How will you know when an actual shift toward a greater customer focus is actually taking root? You’ll know. In addition to the changes in the hard metrics (e.g. sales), you’ll feel it. 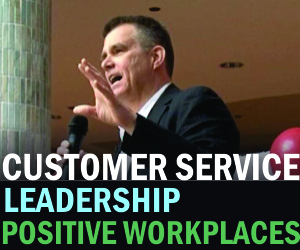 The attitudes of your customers will begin to change, as will those of your employees. There will be less escalations, and greater positive word-of-mouth. Employee satisfaction will improve, and turnover will decrease. There will be a sense of optimism and forward motion.